Pasadena might not have the “big city” draw of Baltimore or Washington DC, but it does have one thing in spades: Style. From the hip uptown to the modernist houses that skirt the suburbs, this is one area that has truly reinvented itself in the last few years. If you are looking to update your own Pasadena MD home, a good place to start is with a new interior paint job. When your old wallpaper starts to peel, and your old paint is showing signs of fading, retire your old look and contact your local Pasadena area painting service to help give your home a brand new look. All Painting and Power Washing is your local service team for Interior Painting in the Pasadena MD area. Did you know that the color you paint your bedroom can directly impact the quality of the sleep that you get every night? It’s true! The colors that you select around your home influence more than just your visitors’ perception of your sense of style – they can have a real psychological impact on the inhabitants of your home. Your bedroom should be the area that you go to unwind after a long day – and it should be devoid of any distractions and bright colors. Repainting your bedroom a darker color like blue or purple instead of its original bright or neutral shade can make a real impact to the quality of your sleep – and it makes your bedroom appear a bit darker at night as well as cozier and smaller. Of course, you can also get a little creative with the bedrooms around your house – and children’s rooms are the perfect places to experiment with new paint ideas. Tired of the same-old boring nursery paint schemes and “blue” or “pink” interior ideas that seem to pervade every home design magazine? Ask our professional painters what they think would look good in your child’s room – and watch as their creativity comes to life. We’ve done everything from fantastic castle scenes to recreations of comic book pages, and we can turn your child’s bedroom into a beautiful mural that will spur their imagination while leaving you with some great memories. Remember, at the end of the day you have to live in your home – so unless you’re planning on selling in the next year, you should pick a paint job that is right for you… not just for some hypothetical buyer down the road. Preparing for the arrival of your painter is actually relatively easy. Our painters are highly professional, and they can help with most of the prep work that needs to be done before they can paint your house. We recommend that you consolidate your belongings as much as possible, keeping everything that you will need for the day in a room that will not be painted that day. Our painters are still more than happy to help with furniture moving and with anything else you need - they are there for you after all. Our painters come equipped with top-notch equipment, including thick commercial grade drop cloths that they will use to protect your floors and your furniture. After all, what’s the use of having a professional painting company coming in to fix up the interior of your house if they leave your floors ruined as a result? We treat every home that we work in as if it was our own, and we make sure that our painters leave your home as beautiful as when they got there… but with fresher interior paint. DIY Or Professional Interior Painters? The biggest difference in the paint job that is possible with a professional crew and the paint job that you might manage on your own is the quality of the tools. While you might be able to do a passable job on a single unbroken surface (like drywall) you will have a much tougher time painting some of the more complex surfaces in your home like trim or accent pieces. On the other hand, your professional Pasadena MD painting crew has all the tools that they need to paint every nook and cranny in your home, and they have professional-level equipment that most consumers don’t buy because they wouldn’t use it more than a couple times during their entire home ownership period. Your professional Pasadena painters have been doing this for a long time, and they know all the ins and outs of a good paint job. Instead of painting a room over and over again because you keep messing up the brush strokes or using the wrong mixture of paint and primer, just leave the job to professionals so it gets done right the first time. Our painters will be in and out in a day or less, and they’ll leave behind a long lasting work of art that will stand the test of time. We use only the highest quality interior paint as well – so you know that it will last. Just because interior surfaces aren’t exposed to the same kind of relentless weathering as exterior surfaces doesn’t mean that you can get by with inferior paint. Interior surfaces still need to be easily cleaned, they need to be smooth and glossy, and they should ideally be repellant of smells and humidity so you don’t end up with peeling paint and an odd smelling house. Pasadena is a maritime community at heart, caught between Lake Shore on one side and Riviera Beach on the other, so you don’t have to look far for design inspirations. You might not be able to spend all your time at the ocean – but you can bring a little bit of the ocean spirit to your Pasadena home with aquatic colors in your home. A room that blends together tans and blues, especially lighter “green infused” blues, evokes the spirit of the ocean and can be combined with whimsical décor and wicker furniture to make your house feel like it is right on the beach… even if you live in the middle of town. 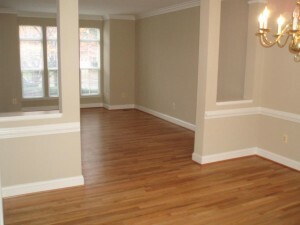 Fill out the form below or just call us at 443-790-7145 for a FREE Estimate on your Pasadena MD painting project. A member of our All Painting and Power Washing service team will be in touch shortly.